Spaghetti alla Carbonara is one of our favorite dishes that I make often because it is such great comfort food: filling and full of flavor. 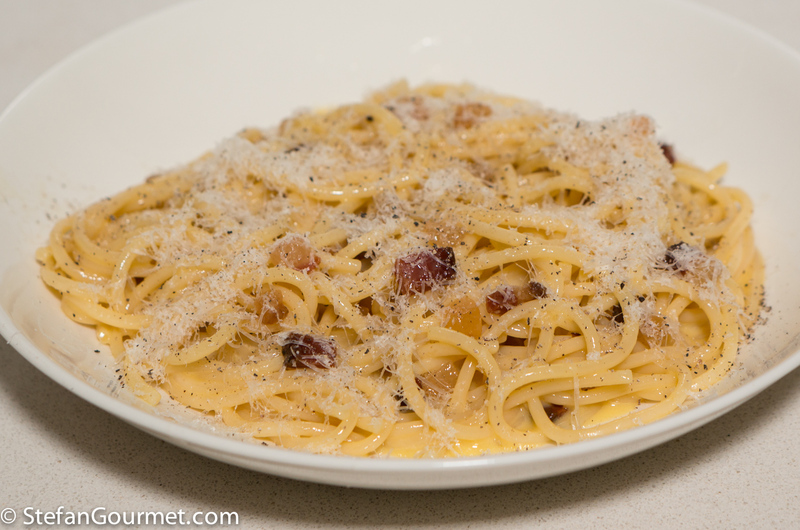 If you are a long time follower of this blog with a good memory, you may remember that I already posted a recipe for carbonara over four years ago. 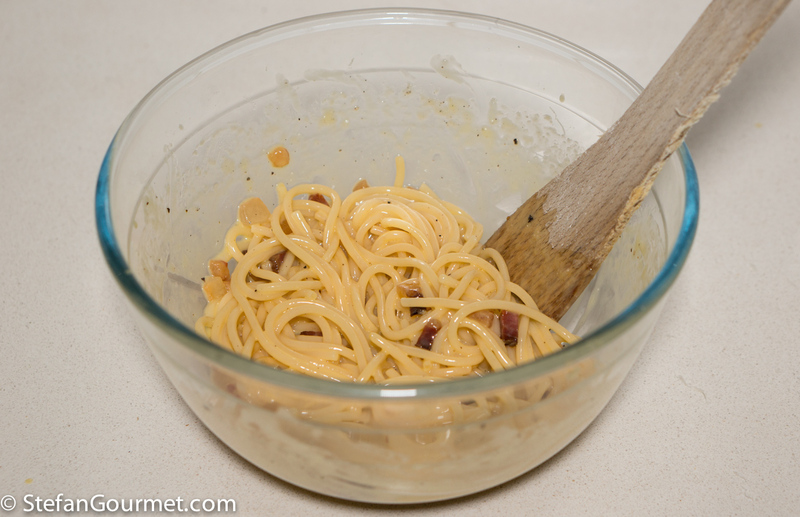 I am writing a post about it again, because the way I’ve been making carbonara has slowly evolved. The two main differences are that I have been going back to the traditional recipe and using only the minimal ingredients (spaghetti, guanciale, eggs, pecorino, salt, black pepper) and that I have changed my way of cooking: ‘cooking’ the eggs in the hot spaghetti in a serving bowl instead of in the pan. 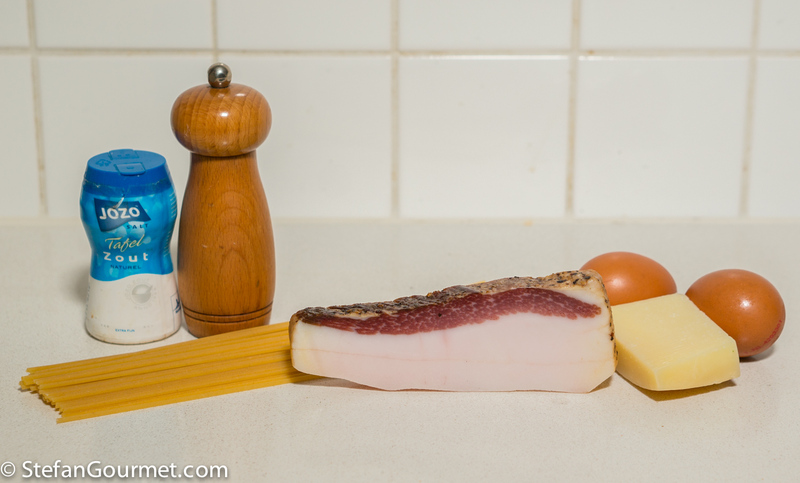 Carbonara may be simple in its ingredients, but it does require some technique to get it right. The raw eggs should be ‘cooked’ by the hot spaghetti. They shouldn’t stay too runny, but they surely shouldn’t scramble either. 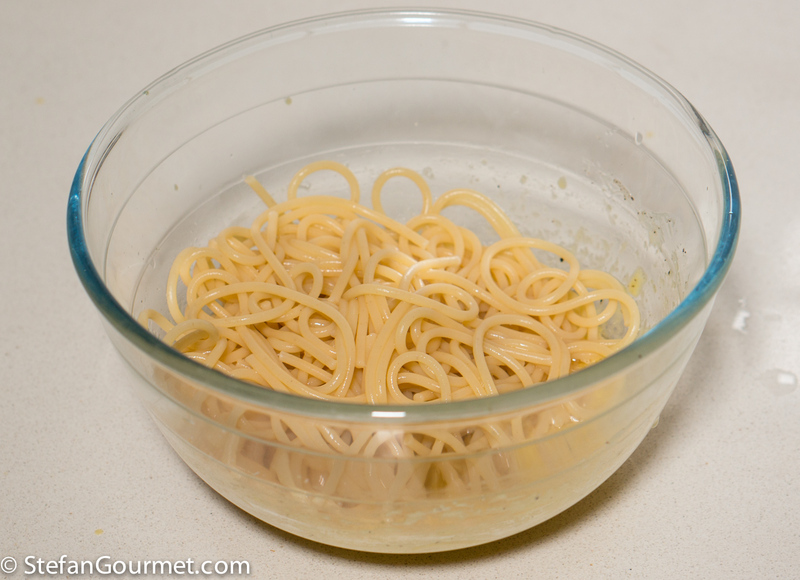 Most Italians perform this crucial step of mixing the eggs with the pasta in the serving bowl. This method is most suited for a large portion of pasta, as a small portion would cool off too much and thus the eggs would stay too runny and the dish wouldn’t be served hot enough. I have found a solution to that, which is to preheat the serving bowl. 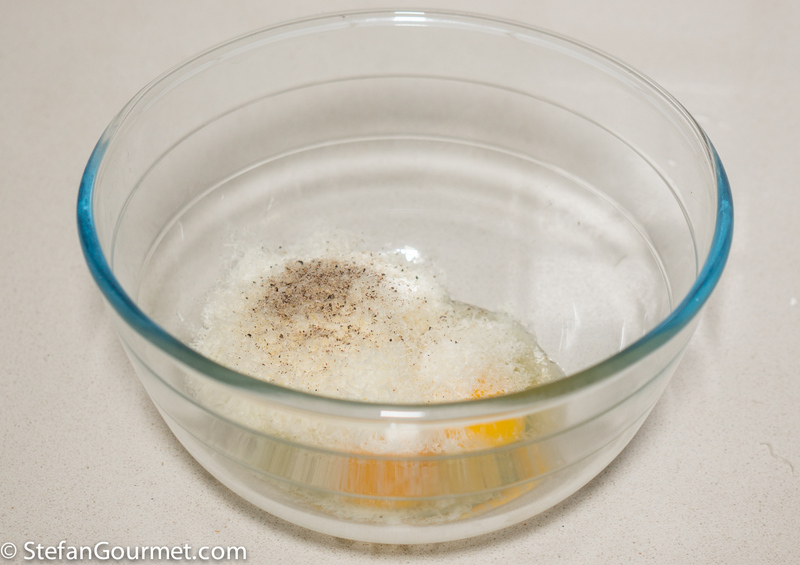 It is important to preheat it to about 50C/125F only, as otherwise the egg would scramble. And that is in fact the major issue with my old method of finishing the dish in the frying pan in which the guanciale was cooked: if you aren’t very careful, you will end up with scrambled eggs with spaghetti, instead of spaghetti coated with thick but still fluid egg. In the frying pan you can get superior results, because you have more control over how much heat to add, but there is also a larger risk of ruining it. And so here is the method for using a bowl. 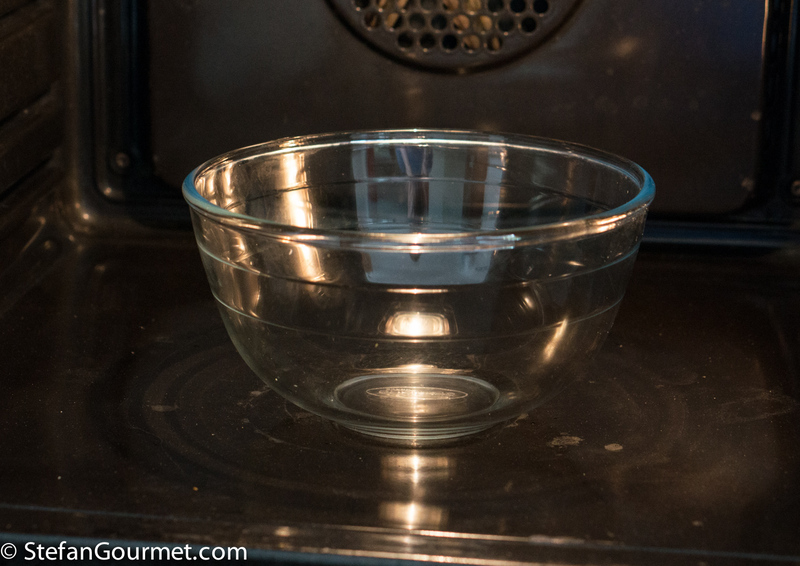 Preheat a large bowl in the oven (at 60C/140F) or by filling it with hot water. Bring a large pot of water to a boil. Add salt and the spaghetti and cook al dente according to package instructions. Meanwhile, put the guanciale in a dry frying pan without any butter or oil over medium heat. 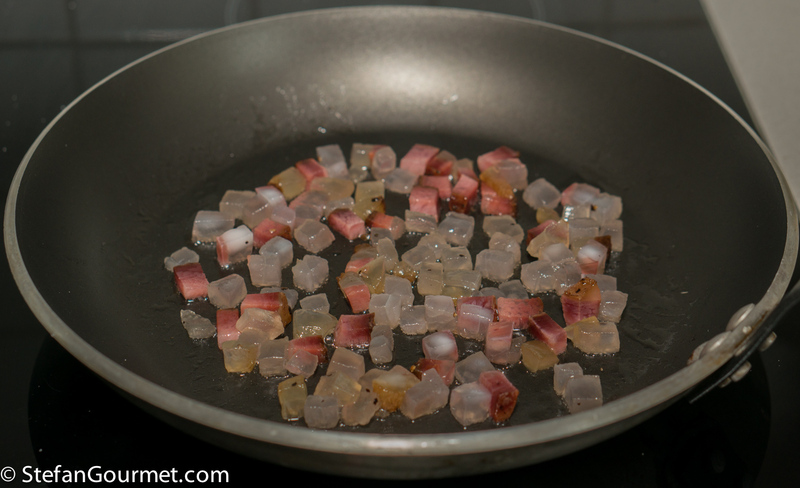 The guanciale will start to become translucent and fat will render from it. 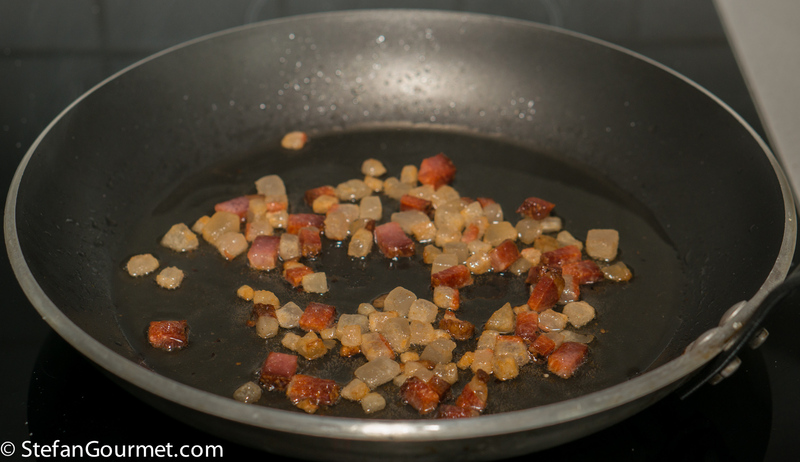 Keep going until the guanciale is golden but not crispy, then turn off the heat and allow to cool off slightly. When the bowl has been preheated to about 50C/125F (it should not be hotter than 60C/140F, or the eggs will cook prematurely! 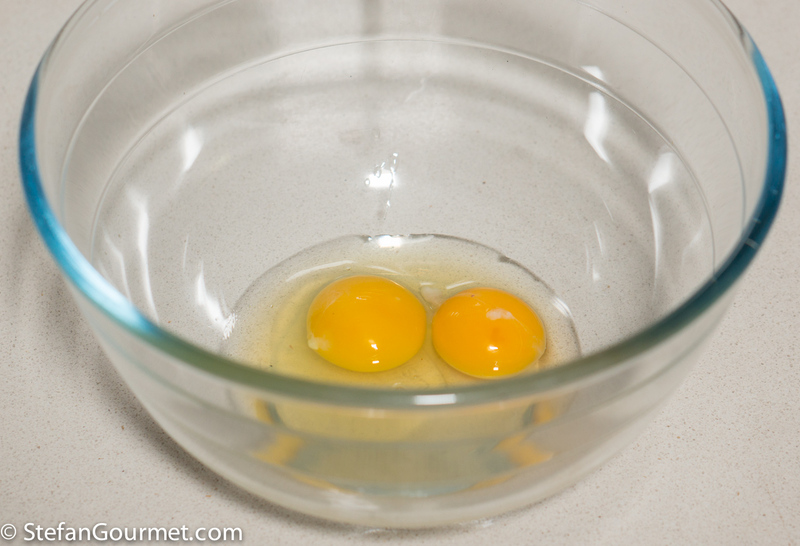 ), add a whole egg and an egg yolk to it. Add freshly grated pecorino and plenty of freshly ground black pepper. 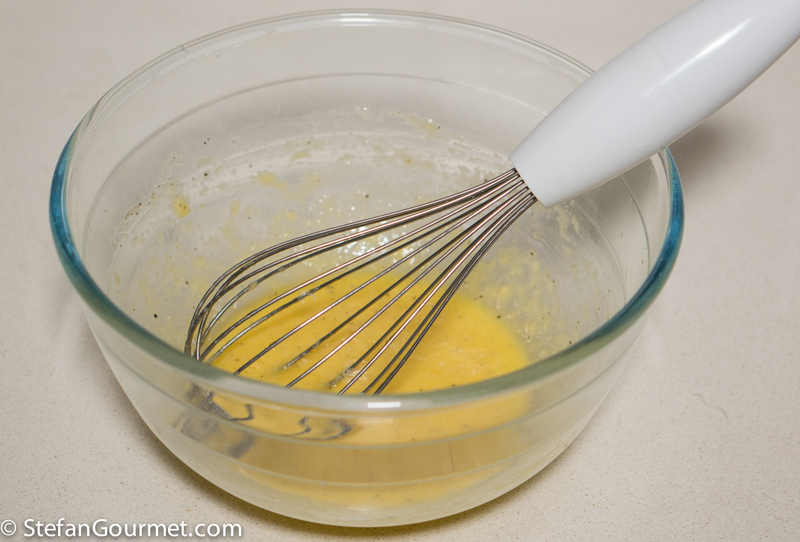 Whisk until the mixture is homogeneous. 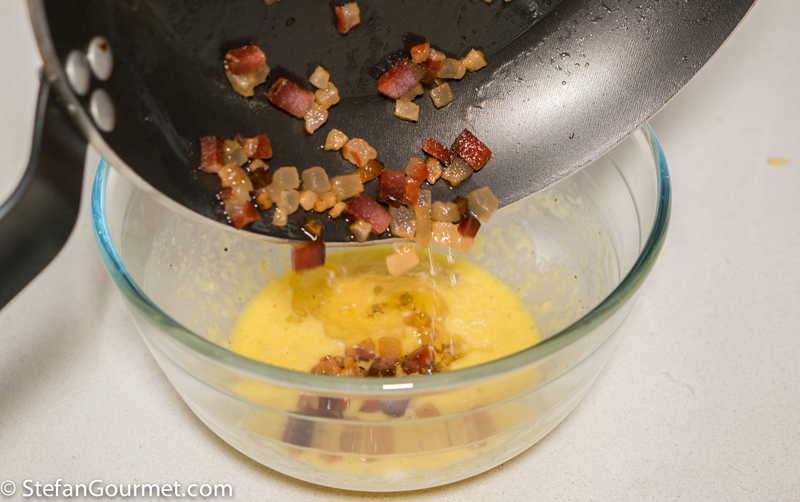 When the guanciale has cooled off to below 60C/140F, add it to the eggs together with some of the rendered fat (spoon off the rest and reserve it for another use — or use all of it if you like). When the spaghetti is al dente, drain it, and add it to the bowl. 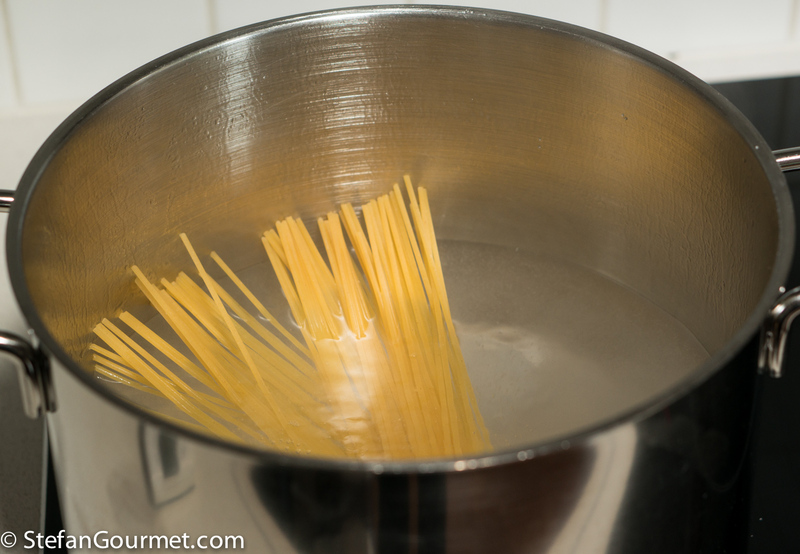 Stir until the spaghetti is coated with the egg mixture. Work quickly, as you’ll want to serve this as hot as you can. Serve on preheated plates (not too hot, 60C/140F, to avoid that the egg will stick to the plate) with more grated pecorino and ground black pepper. Carbonara pairs well with dry whites. 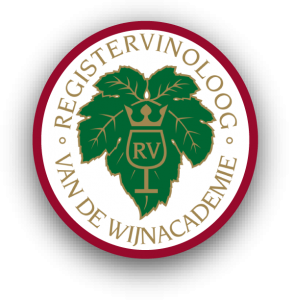 To stay within the region of the dish, a Frascati would be a good choice. 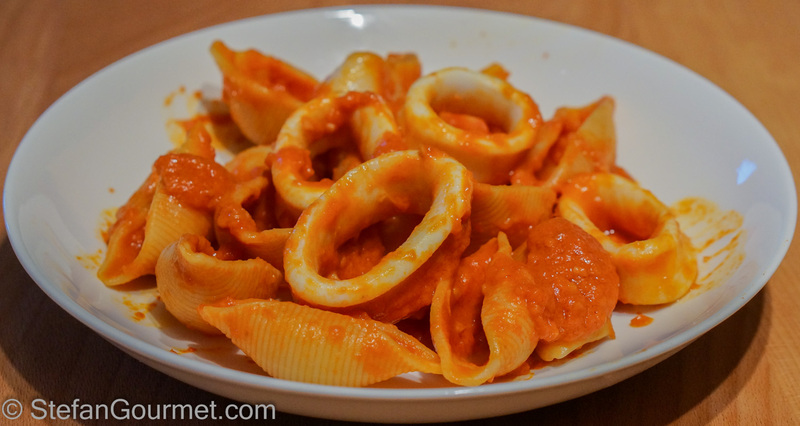 Conchiglie alla Pappagano: pasta shells with calamari, tomatoes, anchovies, and chile pepper flakes. The addition of a bit of butter and cream takes the ‘edge’ off the tomato sauce, and makes it work better with the squid. An egg cooked sous vide at 168 F for 12 minutes cooled just a bit to handle will stir into the pasta without scrambling and dissappear into velvety creaminess. Thanks for the interesting suggestion, I will look into that. The time for cooking at 168F/75.5C will depend on size and start temperature of the egg. Too long, and the white will be set. I use an extra large egg out of the fridge for ten minutes. Sorry for neglecting to include those cucial facts, they are so important! This is my all time favourite pasta dish. Such a simple, comforting dish! Love a good carbonara, looks amazing Stephan, you are so right it’s a short list of ingredients but technique is so imporatnt. I did not know about heating the bowl, next time I will try that. Thank you. The comments printed above have made me feel as if I was doing ‘pasta cookery 101’ . . .after all the years and all the bowls of carbonara handed out to friends and enjoyed myself I have never been quite as perfectionist and should really pay attention and learn 🙂 ! Probably by the time the pasta arrives on the plate in this house too much ‘happy wine’ has been consumed and too much laughter resounds around the table . . . . very interesting a post and yes, I too believe in the classical beginnings of a dish ‘with a name’!! Simple ingredients but complex dish. I loved your walkthrough from start to finish, thank you for the tips!